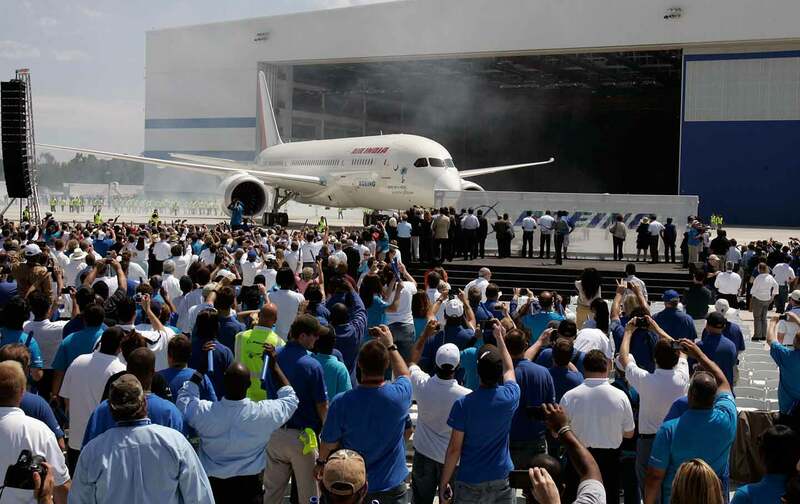 Boeing is fighting a union drive at its 787 Dreamliner plant. Mike Evans has worked as an organizer for the International Association of Machinists and Aerospace Workers (IAM) for more than two decades. He says he’s never had an organizing experience like he’s had in Charleston, South Carolina—home of a 6,000-worker Boeing plant. Last year, when the union tried to sponsor the city’s Cooper River Bridge Run, its check was returned. “We got a letter saying that what we do as a union doesn’t fit with their other sponsors”—which included Boeing, says Evans. The union then tried to sponsor the Knights of Columbus 5K race on Thanksgiving. Organizers of both events declined to comment on why the union’s sponsorship was rejected. This Wednesday, the workers at the plant will vote on whether to unionize. The Boeing 787 Dreamliner plant in North Charleston is the crown jewel of South Carolina’s economic rebirth. Union opponents point to a state economy that is currently growing at twice the rate of the US economy. However, that growth hasn’t meant equal opportunity for all. South Carolina has the 11th highest poverty rate in the United States, with 16.7 percent of its residents living below the poverty line. Despite the opening of new manufacturing plants, the state’s poverty rate is actually higher than when the recession began in 2008. One contributing factor is a lack of unions throughout the state, which depresses wages. In fact, research shows that unions increase workers’ wages and benefits, reduce inequality and poverty, and boost economic mobility across generations. At the North Charleston plant, for example, Evans says that workers in some job classifications are paid half as much as their unionized counterparts in Washington State, and that they often have second or third jobs to help make ends meet. As a result, the IAM has been trying to organize since the plant first opened in 2011. Boeing has countered with billboards and TV ads painting the IAM as an out-of-state organization that previously tried to prevent the plant from opening in order to keep jobs in Washington State. To support its case, Boeing has focused heavily on an NLRB complaint that the union filed in 2011 and later withdrew. In it, the IAM alleged that the company shifted work to South Carolina in order to retaliate against Washington State–based union workers who went on strike in 2009. Boeing workers have been forced to attend anti-union seminars. Management even set up two tables at the plant—one with diapers and children’s clothing, another with groceries—each representing the $800 dollars in union dues that workers would pay annually. This isn’t the first time Boeing has taken on an IAM organizing effort at the plant. In 2015, the company organized town-hall meetings with workers and promised to address their complaints. Many workers believed Boeing’s assurances, and support for the union waned. Fearing a loss, the IAM called off the election. But the union says this time around is different—some of the goodwill workers felt towards the company has worn off. “We are getting much more support than last time because of [Boeing’s] broken promises,” says Evans. Workers say that the plant has reneged on promises to be more responsive to feedback, hold regular meetings with workers to hear criticism, increase wages, and make scheduling more consistent. Union officials say a win on February 15 could be a watershed moment, opening the door for organizing in the South, beginning with the BMW plant in Spartanburg or the soon-to-open Volvo plant in Berkeley County. “This would be the breakthrough of the century if they would win,” says Riley. That’s because corporations and their political allies routinely argue—with great success—that unions in the North are the main reason so many corporations are heading south. South Carolina has the lowest unionization rate of any state in the nation, with only 2.1 percent of its workers organized. Former Governor Nikki Haley was explicit about her desire to keep unions out. “You’ve heard me say many times I wear heels. It’s not for a fashion statement. It’s because we’re kicking them every day, and we’ll continue to kick them,” she said. But Evans and other organizers say a win in North Charleston would be a huge step toward ending that anti-union legacy, finally giving workers in South Carolina a voice in addressing wages and increasing inequality.